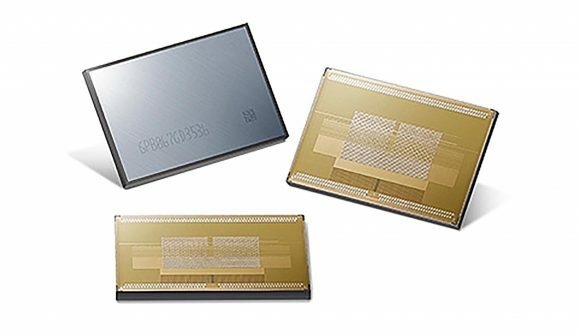 Samsung has announced its latest, third-generation HBM2 (second-gen high bandwidth memory) at GTC 2019, which it calls Flashbolt. Capable of 3.2Gb/s transfer speeds and capacity up to 16GB in a single stack, Samsung’s HBM2E memory dwarfs previous generations of HBM2 memory, and makes even the AMD Radeon VII’s quad-stack 16GB HBM2 running at 2Gb/s seem rather civilian by comparison. Despite a relatively small footprint compared to GDDR5/6 products, there are up to eight stacks of memory (8-Hi) within every single HBM2 package, connected with through silicon vias (TSVs). AMD utilised HBM2’s tiny package size with its Vega architecture, fitting 8GB of the stuff up into the RX Vega 64 and RX Vega 56. 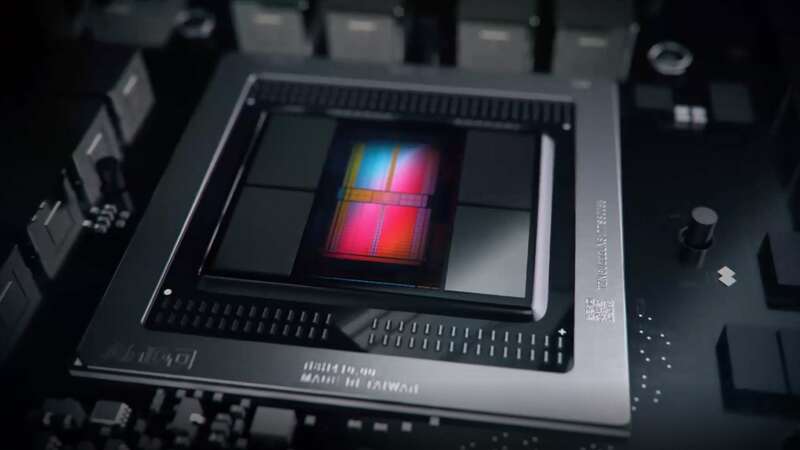 It then followed that up in February with the launch of the Radeon VII, doubling memory capacity of its forebears to 16GB of HBM2. This was achieved with four memory stacks (4-Hi a piece). Yet that could be achieved with just one 8-Hi Samsung Flashbolt HBM2E package. Each die is capable of a tremendous 16Gb capacity, stack up eight of ‘em and you’ve got a 16GB package managing 410 GB/s data bandwidth. But HBM2 is pricey. AMD already fell foul to memory pricing woes when trying to roll out consumer targeted HBM2 graphics cards, only recently managing to just about thread the price/performance needle with the Radeon VII. As such, this high-performance memory tech garners the most love from the burgeoning professional GPU and IC market. Nvidia stuffed 12GB of HBM2 within the Titan V, but has never taken the plunge on the memory tech in the mainstream market. Instead the green team opted for cheaper and plenty capable enough GDDR6 packages within the RTX 20-series and 16-series graphics cards, with the sole exception of the GTX 1660 on GDDR5. It was just over a year ago that Samsung rolled out second-gen HBM2 nicknamed Aquabolt: 8GB HBM2 running at 2.4Gb/s for a total of 307.2GB/s. That was already a significant step up over its first gen memory, which had to break HBM2 spec and increase voltage up to 1.35V to break the 2Gb/s barrier. So far, Samsung has kept quiet on Flashbolt voltages, but it may need to bump voltages once again to hit 3.2Gb/s.